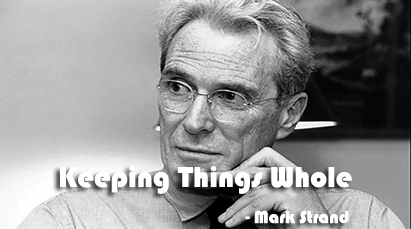 Mark Strand was a Canadian-born American poet, essayist and translator. He was appointed Poet Laureate Consultant in Poetry to the Library of Congress in 1990 and received the Wallace Stevens Award in 2004. The poet misses himself in the fields. Wherever he goes, he misses himself, not others. Wherever the poet goes, he parts the air and air fills the space of his body. For all reasons we move, the poet moves in order to keep all things whole. Answer: The poem deals with two separate things of anything which are part and whole. The poet has small parts. It is divided into the separate elements. He has lost himself in the field. He is losing himself everywhere. The poet parts the air forward but it becomes whole behind him. He only makes the air hole, not a part. The air becomes a whole immediately. We are moving to part but everything becomes whole itself. We see field, air, etc. as a part not a complete. Our lives are also parted but it is only illusion. If we try to make separate parts, that is hollowness of concept. Answer: The poet has presented himself in the field missing and parting in the air and he is whole, not part in the backdrop. He wants to be whole, not part. Answer: The last stanza suggests that we all move to make a whole, not part. The poet moves forward and he parts the air but it becomes whole again so what we think of being parted. That is wrong. Everything in the world is whole. Summary Of "Keeping Things Whole"
Word Meanings Of "Keeping Things Whole"
Question Answers Of "Keeping Things Whole"
Class 11 Course "Keeping Things Whole"
0 Response to "Keeping Things Whole | WordMeanings | Summary | Question-Answers"